While Human Torch is active, he deals 1 damage to a character or player each time you field a character (not 1 damage per die). Global: Pay when you deal damage with an action die or global ability to deal one extra damage to one target. Hulk: Green Goliath's ability can be activated multiple times per turn by Human Torch. For example, if your opponent has Hulk and Human Torch: “Flame On!” fielded, Hulk could be dealt 1 damage each time your opponent fields a character, causing Hulk to deal 2 damage to your characters each time he takes damage. Note that if something increases the amount of damage dealt to be "more" damage, Hulk wouldn't trigger an additional time. The Human Torch: "Flame On!" global ability is not a new source of damage and can only increase damage being dealt. It can only add damage to a character who is already taking damage. Human Torch's Global Ability cannot be purchased multiple times. 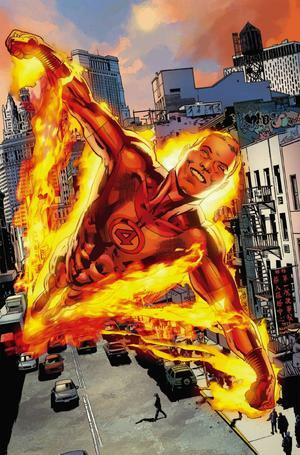 Certain global abilities, such as that of Human Torch and War Machine need something to happen for them to react to. They may only react in the appropriate window and only react once. After the first use, you're no longer reacting to the initial damage, you're reacting to an increase in damage or in War Machine's case you're reacting to a Global and not a character dealing damage to your opponent during the Attack Step.